Today is an auspicious day, the birthday of Lama Ole. 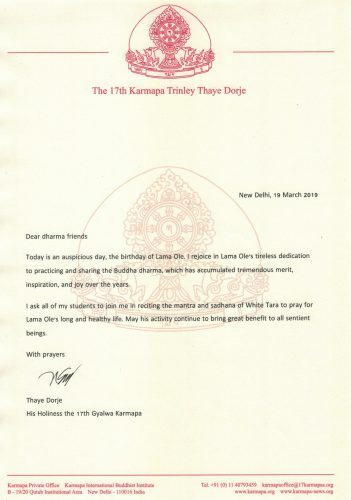 I rejoice in Lama Ole’s tireless dedication to practicing and sharing the Buddha dharma, which has accumulated tremendous merit, inspiration, and joy over the years. I ask all of my students to join me in reciting the mantra and sadhana of White Tara to pray for Lama Ole’s long and healthy life. May his activity continue to bring great benefit to all sentient beings.